This page was originally developed to provide supplementary materials for an introductory course in chemistry. Links to the home page for that course, to the home page for this site, and contact information are in the navigation bar at the top of this page; they are also at bottom of page. Most of the sections below are listed in the order they first become relevant in my Intro Chem class. Chapter references are to the Intro Chem textbook by Cracolice & Peters, 2/e, 2004. Some items are intended as general; these are at the end of the list. Nucleosynthesis; astrochemistry; nuclear energy; radioactivity (Ch 5, 10, 21) + New 12/14/18. You may find links of interest on my other pages of Internet Resources, either for other specific courses or the chem-miscellaneous, miscellaneous, or introductory pages. All of these are available from the List of pages of Internet resources. Some of these sites provide activities that you can do on your own. Others are collections of lab information, including useful videos. The idea of "kitchen" labs is that you do not need access to specialized lab supplies. The Anytime Anywhere Chemistry Experience (AACE) is a project of Drs Jimmy Reeves (Univ North Carolina, Wilmington) and Doris Kimbrough (Univ Colorado, Denver). https://www.uncw.edu/chem/Courses/Reeves/OnLineLabs/. Some experiments include computer simulations as well as "kitchen" activities. Chemistry Experiment Simulations and Conceptual Computer Animations, from Tom Greenbowe and the Chemical Education Research Group, Department of Chemistry, Iowa State University (now at University of Oregon). https://chemistry.uoregon.edu/profile/tgreenbo/. See the note there about Computer Simulation materials. Materials cover a wide range of basic chem topics. Chemistry animations and movies on the World Wide Web. Links to chemistry animations around the web, from Gabor Lente, University of Pécs (Hungary). http://lenteg.ttk.pte.hu/animate.html. An old page; not updated but probably still useful. I list another of Lente's pages under Library Matters: More sources of journals online. Also see Misc Chem Internet Resources - Lab tools. That section is about specific laboratory techniques. Beyond the Molecular Frontier: Challenges for Chemistry and Chemical Engineering. What do chemists do? A report on the future of chemistry, from the National Research Council, 2003. https://www.nap.edu/catalog/10633/beyond-the-molecular-frontier-challenges-for-chemistry-and-chemical-engineering. For a short summary -- a good place to start -- see their link to a "PDF Brief" file, under "Download Free". 110. In August 2003 element 110 was officially named darmstadtium, Ds, after the city of its birth. The announcement is: Element 110 is named darmstadtium. http://old.iupac.org/news/archives/2003/naming110.html. 112. In June 2009, IUPAC announced formal acceptance of element #112. In February 2010, they announced an official name: copernicium, Cn, after the pioneering Polish astronomer. The official name was published in K Tatsumi & J Corish, Name and symbol of the element with atomic number 112 (IUPAC Recommendations 2010), Pure Appl Chem 82(3):753-755, 2010. Publication date (Web): 2/24/10. It is freely available at: https://www.degruyter.com/view/j/pac.2010.82.issue-3/pac-rec-09-08-20/pac-rec-09-08-20.xml. * 114 & 116. Chemical elements 114 & 116: flerovium & livermorium are now official names (June 5, 2012). * 113, 115, 117, 118 (Proposed names). Nihonium, moscovium, tennessine, and oganesson (June 11, 2016). These names were subsequently approved, as official. Added February 24, 2019. More in the Musings newsletter about elements 113 and 115: Measurement of atomic mass of superheavy atoms (February 24, 2019). All of the element names noted above (up through 118) are shown on the periodic table that I post on my Download page. Etimologio de la nomoj de kemiaj elementoj. Etymology of the names of the chemical elements -- written in Esperanto, and also available in German. From Dr. Reinhard Foessmeier, a German mathematician at the Akademio Internacia de la Sciencoj (AIS) in San Marino. http://www.ais-sanmarino.org/scio/elemetim.html. This site is also listed under Miscellaneous Chem Internet Resources. * Elementymology & Elements Multidict, by Peter van der Krogt, Univ Utrecht. http://www.vanderkrogt.net/elements/. Includes history of the discovery of each element, as well as information about the name. The Elements Multidict part of the site gives the element names in 98 languages. The site author says "I am not a chemist, but a (map) historian much interested in the origin of names. ... I tried to do some new etymological research on the element names, and find the original articles where the discoverer of a new element announced his find and explained the naming." An excellent presentation of unit conversions: https://brownmath.com/bsci/convert.htm. On this page, Stan Brown emphasizes the importance of "a well-chosen form of 1". He includes many examples, of increasing complexity, and a few practice problems. A "self-help" worksheet on dimensional analysis that I wrote a few years ago. It contains brief explanations, but extensive sets of practice problems. See the Chemistry practice problems page. Why isn't 0° F the lowest possible temperature for a salt/ice/water mixture?. http://antoine.frostburg.edu/chem/senese/101/solutions/faq/zero-fahrenheit.shtml. An elaboration of the story of how the zero point for the Fahrenheit temperature scale was set. This is part of Fred Senese's site, which is listed below as a General resource. The following article, which has free online access, is listed in the Ch 3 handout: K Jensen et al, An atomic-resolution nanomechanical mass sensor. Nature Nanotechnology 3:533, 9/08. There has been considerable work in recent years on developing nano-balances: balances capable of weighing single atoms or molecules by mechanical means. This one uses the principle that the resonant frequency of an object depends on its mass. It operates at room temperature, and uses carbon nanotubes. A potential use of such balances is weighing individual protein molecules, under gentle conditions. Regardless of use, this is fun! The paper is available at Zettl's UC Berkeley web site: http://research.physics.berkeley.edu/zettl/pdf/351.NatureNaotech.3-Jensen.pdf. A good intro to the work at Zettl's site: http://research.physics.berkeley.edu/zettl/projects/nanobalance/mass.html. A good news story about this work: Nanotube 'springboard' weighs clinging atoms; 7/21/08. https://www.newscientist.com/article/dn14370-nanotube-springboard-weighs-clinging-atoms/. That article is also the subject of a post in my Musings newsletter: Weighing gold atoms (September 24, 2008). Energy is sometimes given with reference to the explosive TNT. For example, a bomb may be rated at 50 kilotons (kt) of TNT. That means that it gives off as much energy as would the explosion of 50 kt of TNT. In fact, the equivalence has been formally defined, and is not dependent on quibbling about exactly how much energy the TNT gives off: The energy unit "gram of TNT" is defined as 1 kcal or 4184 J. Of course, the kiloton and megaton are more common forms of this unit. TNT-based energy units are also used to describe natural events, such as earthquakes. For more, see the Wikipedia page: https://en.wikipedia.org/wiki/TNT_equivalent. A complete list of metric prefixes, from yotta to yocto -- with examples of their use, is at my web site. The kilogram is the only unit that is still defined by a specific physical object, in this case a bar stored in Paris and declared to be the official kilogram. Physicists would love to develop a definition of the kilogram that is more fundamental, but it is proving to be a difficult task. One possibility is to declare a value for Avogadro's number (Ch 7); that would fix the magnitude of the mass unit. The following items are on this kilogram story. #1 is an enjoyable essay, more from the chemists' side. #2 is broader. * 1. R F Fox & T P Hill, An exact value for Avogadro's number. American Scientist 95:104, 3/07. https://www.jstor.org/stable/27858920. Check Google Scholar for a freely available copy from the authors. * 2. I Mills, An update on the kilogram. Chemistry International [online news magazine of the International Union of Pure and Applied Chemistry (IUPAC)] Vol 27 #5. 9/05. http://old.iupac.org/publications/ci/2005/2705/3_mills.html. With all the emphasis on using units based on powers of ten, why don't we do that for time? Well, people have thought about it. The Wikipedia page on Metric time gives a nice overview. https://en.wikipedia.org/wiki/Metric_time. Have you wondered about the stories -- real or imagined -- behind the names of the units? Read Ken Woolner's biographical article on Claude Emile Jean-Baptiste Litre (1716-1778) -- and his daughter Millie. The article was originally published in Chem 13 News, at the University of Waterloo, April 1978. It was reprinted in the April 2009 issue, and is featured as a classic Chem 13 News article. https://uwaterloo.ca/chem13news/sites/ca.chem13news/files/uploads/files/Jean%20Litre-article.pdf. Book. Listed on my page of Books: Suggestions for general science reading... Tavernor, Smoot's Ear -- The measure of humanity (2007). The following article, which has free online access, is listed in the Ch 3 handout: B C Stoel & T M Borman, A comparison of wood density between classical Cremonese and modern violins. PLoS ONE 3(7):e2554. 7/08. Ch 3 defines and describes density. But why is it important? This article suggests that variations in density through a piece of wood, due to climatic variation, is important to the quality of violins. They use "CAT" scans (at a New York hospital) to measure the density at various spots on the violins, which range from a 1715 Stradivarius to some 21st century violins made by one of the authors. The article is freely available at https://journals.plos.org/plosone/article?id=10.1371/journal.pone.0002554. As of late 2016, all elements up through 118 have been officially recognized and named. Some of the developments concerning new elements have been noted in my Musings newsletter. Here is a list of those posts. It includes posts about both discovery and naming of the elements. * Four new chemical elements officially recognized (January 12, 2016). Elements 113, 115, 117, and 118. * Chemical elements 114 & 116: flerovium & livermorium are now official names (June 5, 2012). * Chemical elements 114 & 116: flerovium, livermorium (proposal) (December 5, 2011). * Chemical elements 114 and 116 officially recognized (June 8, 2011). * Chemical element #117 (April 13, 2010). * Element #112: Copernicium (July 15, 2009). The following sections have older information about some of these elements. I may consolidate all that into this section. April 2008 brings a claim of discovering element #122. In nature. The periodic table would place #122 under thorium; the claim is that they have found a small amount of this element in a sample of Th. The technical issues are complex -- and controversial. There is a Wikipedia page for element #122, which is provisionally named unbibium based on its digits: https://en.wikipedia.org/wiki/Unbibium. This page links to the paper making the claim, which so far has not yet been formally published, and to some discussions of it at various sites. Again, both the paper and the criticisms are quite technical. Most of us will just sit back and watch as this story plays out. I suspect that those maintaining the Wikipedia page will keep up informed. As of May 2010, the Wikipedia page includes a paper that seems to exclude the original claim, by better experimental data. Until something better comes along, I suspect this is "the right answer" for now. I have not added #122 to my periodic table. In February 2004 two new elements were announced, from the lab in Dubna, Russia, in collaboration with Lawrence Livermore Lab. They made #115 by direct bombardment, and observed #113 among the decay products. The elements were actually made in July and August, 2003. * Livermore Scientists Team With Russia To Discover Elements 113 and 115. https://www.llnl.gov/news/livermore-scientists-team-russia-discover-elements-113-and-115. Announcement from Lawrence Livermore, February 2, 2004. * Transactinides: New superheavy elements created -- High-energy experiments produce a few atoms of elements 113 and 115. http://pubs.acs.org/cen/topstory/8206/8206notw1.html. From C&EN, February 9, 2004; includes a link to the published article announcing the elements. These sites are also listed on the page Science on the Internet: an introduction. The work reported here was not accepted as the official discovery of element 113. The naming of these elements is noted above, in the section Names of elements. I have updated the periodic table that I post on my Download page to show these new elements. Added February 24, 2019. More about elements 113 and 115 in my Musings newsletter: Measurement of atomic mass of superheavy atoms (February 24, 2019). Also see the next sections for information about the making of other heavy elements. A new chemical element has been reported. Element #117 was made by bombarding a target of berkelium (Z = 97) with calcium nuclei (Z = 20). Occasionally, fusion of Bk and Ca nuclei occurs, giving a nucleus with 117 protons. Such events are identified by following their decay products. Six atoms of the new element were detected -- over about two months. Assuming that all the tentative reports are confirmed, there are currently no gaps in the periodic table. Elements 1-118 have all been reported. Until it is confirmed and formally accepted, the new element will be known as ununseptium (Uus). News story: International team discovers element 117. From Oak Ridge National Laboratory, one of the cooperating labs. Originally posted as a news release, April 7, 2010. https://www.ornl.gov/news/international-team-discovers-element-117. "Viewpoint" story accompanying the article: S Hofmann, Exploring the island of superheavy elements. Physics 3:31, April 9, 2010. Freely available at: http://physics.aps.org/articles/v3/31. It also links to the article itself; use the special "free" link. I have updated the periodic table that I post on my Download page to show this new element. This news was also presented in the Musings post Chemical element #117 (April 13, 2010). That post links to others on the chemical elements. Also see previous sections, immediately above, for information about the making of elements #113, 115 and 117. October 2006 brought the announcement of element 118, from Lawrence Livermore National Lab (LLNL) and the Joint Institute for Nuclear Research (JINR), in Dubna, Russia. The press release from LLNL, Livermore scientists team with Russia to discover element 118, is at https://www.llnl.gov/news/livermore-scientists-team-russia-discover-element-118. That press release has some visuals you may find interesting, and it also links to the published article. 1999 was an interesting year for new elements -- and Berkeley was part of the story. January brought a "rumor" that a single atom of element #114 had been detected by a team of scientists at the Joint Institute for Nuclear Research, in Dubna, Russia. (The event itself was in December, 1998.) Interestingly, the new atom lasted for about 30 seconds, thus perhaps supporting the idea that we are beginning to get into a region of more stable isotopes. Then in June Lawrence Berkeley Lab (LBL) reported they had made elements #118 and 116. However, LBL has retracted that claim. Further work -- at LBL and elsewhere -- did not support the initial claim; it is likely that the original report was fraudulent. Information about all this is at: http://enews.lbl.gov/Science-Articles/Archive/elements-116-118.html. (Now archived.) The figures include a diagram showing all known isotopes for the "superheavy" elements. Why do we say "#118 and 116" -- in that order? Well, according to the original report, they directly made #118. It decayed by a series of α (alpha) emissions. The first decay product was #116, also a new element. In July, the Russian group officially reported their work on #114: Oganessian et al, Nature 400:242, 7/15/99. The article contains some interesting graphs showing stability of known isotopes of super-heavy elements -- and some theoretical predictions. There is an accompanying news item on p 209; this may serve as a good starting point to learn about this new burst of work. Superheavy Element 114 Confirmed: A Stepping Stone to the Island of Stability, September 24, 2009. Lawrence Berkeley Lab reports an "independent confirmation" of element #114. https://newscenter.lbl.gov/2009/09/24/114-confirmed/. That press release links to the publication. This confirmation should set in motion the process of officially recognizing element #114. If the evidence is accepted, the original discovers would then propose a name for the new element. For light microscopy, see a section of my page Internet resources: Biology - Miscellaneous on Microscopy. The general theme in this section is methods to observe atoms. Of course, the methods can also be used to observe larger things. Most of the section is about AFM. In class we show an example of how AFM can be used to observe atoms. The following sites show many examples of AFM. They show atoms and many other things, covering a broad range from biology to engineering. Look around, and enjoy both the science and the art. https://web.archive.org/web/20150626072707/https://researcher.watson.ibm.com/researcher/view_group.php?id=4245. The STM Image Gallery at IBM in San Jose; now archived. (STM = scanning tunneling microscopy, one variation of AFM.) This site includes the IBM logo, written with xenon atoms, and the carbon monoxide man. I suggest that you start with the "Atomilism" section of the gallery. Caution... Linked sub-pages may load slowly; be patient. STM Principles. A discussion of how scanning probe microscopy works. Fairly technical but readable and well illustrated. http://ip.physics.leidenuniv.nl/index.php/component/content/article/15-cat-info/46-stmprinciples. From the Interface Physics Group, Leiden University. Nobel prize. The 1986 Nobel Prize for physics was awarded for the invention of the AFM, and for developments in electron microscopy. Nobel site: https://www.nobelprize.org/prizes/physics/1986/summary/. Electron microscopic (EM) observation of atoms. Seeing individual atoms for light elements by EM is difficult simply due to the weak signal. Alex Zettl's lab at UC Berkeley has reported seeing individual atoms of carbon and hydrogen. The trick was using graphene as the support material. Graphene is a sheet of graphite one atom thick -- a strong but almost transparent support material. A news story about this work: Seeing the smallest atom - Graphene helps a team use a transmission electron microscope to image individual hydrogen atoms. Here is a good blog entry about this, by R Piquepaille at ZDNet, July 19, 2008: https://www.zdnet.com/article/looking-at-single-atoms-of-hydrogen/. The paper itself, which is listed in the Ch 5 handout, is J C Meyer et al, Imaging and dynamics of light atoms and molecules on graphene. Nature 454:319, 7/17/08. It is posted at Zettl's web site: http://research.physics.berkeley.edu/zettl/pdf/350.Nature.454-Meyer.pdf. This work is discussed in the Musings post Image of a carbon atom that isn't there (August 17, 2008). * Making triangulene -- one molecule at a time (March 29, 2017). * Progress toward an ultra-high density hard drive (November 9, 2016). * A rapid test for antibiotic sensitivity? (July 19, 2013). * Graphene bubbles: tiny adjustable lenses? (January 15, 2012). * The smallest electric motor (September 26, 2011). * Nanorobots: Getting DNA to walk and to carry cargo (August 7, 2010). * The 35 most famous xenon atoms (June 29, 2010). * Using DNA to make computer chips (September 25, 2009). * Seeing molecules under a microscope (September 19, 2009). * It includes the names of the elements. I think this is particularly useful for new chem students. IUPAC: Periodic Table of Elements. From the International Union of Pure and Applied Chemistry (IUPAC). Current version is dated November 2016. Includes a PT as an image file, as well as pdf versions. The page is full of information on recent changes, as well as the procedures for accepting and naming new elements. There is a post in my Musings newsletter about the IUPAC periodic table, with a focus on their new approach to variability of atomic weights among samples of an element. The new IUPAC periodic table; atomic weight ranges (August 1, 2017). * Royal Society of Chemistry (England): http://www.rsc.org/periodic-table. Worth exploring for the visuals. Recommended by an Intro Chem student. The Internet Database of Periodic Tables: https://www.meta-synthesis.com/webbook/35_pt/pt_database.php. A major collection of periodic tables, and related information. It includes historic periodic tables, as well as many that illustrate the diverse ways that have been suggested for presenting it. It is part of the Chemogenesis web site from Mark Leach, Meta-Synthesis, England. Another page of that web site is listed below in the section Nucleosynthesis; astrochemistry; nuclear energy; radioactivity. Biochemical periodic table . The elements are classified and color-coded by their role in biology. Clicking on a element returns information about the biological properties. http://eawag-bbd.ethz.ch/periodic/. This page is part of the Biocatalysis/Biodegradation Database site (originally from the University of Minnesota and now part of EAWAG), which is listed on my page Science on the Internet: an introduction. Another page from the site, a nice list of Useful Internet Resources for Microbial Biotechnology, is listed on my page Internet resources: Biology - Miscellaneous, under Microbiology: other. The periodic table of videos. A periodic table for the YouTube generation. Click on any element to bring up a brief video presentation about the element. The videos are by Dr Martyn Poliakoff, University of Nottingham. http://www.periodicvideos.com/. An Earth Scientist's Periodic Table of the Elements and Their Ions, from L. Bruce Railsback, Department of Geology, University of Georgia. A special PT organized around the ions that are relevant to mineralogy. If you are interested in minerals, this may be very useful. In any case, it is artistically interesting, and fun. http://www.gly.uga.edu/railsback/PT.html. Also in Chinese, Portuguese, Spanish. Elemental haiku. http://vis.sciencemag.org/chemhaiku/. From Mary Soon Lee. This was published in Science (357:461, August 4, 2017), but the web version is interactive: hover the mouse over an element in the table, and read the corresponding haiku at the top. Elements 1-119. Interactive Periodic Table of the Elements, in Pictures and Words. https://elements.wlonk.com/ElementsTable.htm. From Keith Enevoldsen. A periodic table that is simple, attractive, and informative. Click on an element for more information, usually about a use. It's elemental: The periodic table. A collection of 89 essays, covering all the elements, originally published in the 80th anniversary issue of C&EN (Chemical & Engineering News; Sept 2003), the news magazine from the American Chemical Society. The entire collection is now available online. http://pubs.acs.org/cen/80th/elements.html. A searchable periodic table. Choose a property, and ask for all elements with values between limits that you specify. For example, you might ask for all elements with boiling points between 500 and 1000 K. Simple and fast; a model for how web pages should be. https://www.stolaf.edu//people/hansonr/ptable/. From Bob Hanson & Melanie Casavant, St Olaf College, Northfield, Minnesota. Periodic Tables of the Elements in Three Hundred Languages. Now archived at http://web.archive.org/web/20120218114331/http://www.jergym.hiedu.cz/~canovm/vyhledav/chemici2.html. * Science History Institute (formerly Chemical Heritage Foundation): https://www.sciencehistory.org/historical-profile/julius-lothar-meyer-and-dmitri-ivanovich-mendeleev. * Classic Chemistry, from Carmen Giunta at Le Moyne College, Syracuse, NY: http://web.lemoyne.edu/~giunta/EA/MENDELEEVann.HTML. Theo Gray's periodic table table. How about a periodic table that is actually a table? And contains samples of the elements? See a delightful short video: https://www.youtube.com/watch?v=FHRGxkzHT7w. Book. A related book by Gray is listed on my page of Books: Suggestions for general science reading... Gray, Molecules -- The elements and the architecture of everything (2014). Table of Condiments That Periodically Go Bad. http://web.mit.edu/dryfoo/www/Info/condiments.html. From MIT. The Periodic Table Mysteries, by Camille Minichino. Camille Minichino is a San Francisco area physicist (Lawrence Livermore National Lab) -- who also writes mystery novels. Her book "The hydrogen murder" was published in 1997, "The helium murder" in 1998. Most recently, "The oxygen murder" was published in 2006. Some of these are set in the San Francisco area. Some of these books are available in the Berkeley Public Library. See her web site, http://www.minichino.com, for more information. (Recommendation? No, I haven't seen them. But I thought it was a fun story worth passing on. A teacher on the Chemed-L list said that she enjoyed the books, and shared them with her classes.) I have also listed Minichino's books on my page of Books: Suggestions for general science reading. If you really cannot be without a periodic table, check out: https://www.thinkgeek.com/product/8a2f/?cpg=39T. Discovery of the neutron. The neutron was announced in a short paper in the February 27, 1932. issue of Nature. The paper is freely available through a special collection of historic papers in physics that were originally published in Nature. The paper is: J Chadwick, Possible Existence of a Neutron. Nature 192:312, February 27, 1932. http://www.nature.com/physics/looking-back/chadwick/index.html. Chadwick was awarded the 1935 Nobel Prize in physics for the discovery: https://www.nobelprize.org/prizes/physics/1935/summary/. Also see list of posts in my Musings newsletter, below. One of the questions inevitably raised by our simple model of the atom is what holds the nucleus together -- with all its positive charges. The answer is "the strong nuclear force" -- a topic well beyond our course. Three scientists responsible for developing our understanding of this force, in the early 1970s, received the 2004 Nobel Prize in physics for their work. For an introduction to the strong nuclear force, see the Nobel site https://www.nobelprize.org/prizes/physics/2004/summary/, or an article in the Caltech alumni magazine Engineering & Science (D L Smith, Quark Tale, E&S Vol 67(3), p 8, 2004) http://calteches.library.caltech.edu/4122/1/Quark.pdf. In August 2005, IUPAC issued revised values for the atomic weights of 16 elements. Why? Mainly due to improved analysis of isotopic abundances. Panic not... None of the revisions affect anything before the fifth digit, and some have no effect before the ninth digit. http://old.iupac.org/news/archives/2005/atomic-weights_revised05.html. * Added March 18, 2019. Pandas: When did they become specialized to eat bamboo? (March 18, 2019). * Added December 1, 2018. Data on 31 isotopes of cadmium support a new model for the structure of atomic nuclei (December 1, 2018). * Role of biological processing in the formation of a uranium ore (June 30, 2017). * Is photosynthesis the ultimate source of primary production in the food chain? (April 2, 2017). * The collision of Theia with Earth: head-on? (February 29, 2016). * Life on Earth 4.1 billion years ago? (November 2, 2015). * Discovery of a chemical of biological origin from Mars? (January 2, 2015). * The proton -- and a 40 attometer mystery (March 17, 2013). * A new, simple way to measure bone loss? (September 14, 2012). * The Moon: might it be a child with only one parent? (April 13, 2012). * Quiz: What is it? (March 6, 2012). See the answer. * Were comets the source of Earth's water? (February 3, 2012). * Why would a plant have leaves underground? (January 21, 2012). * Hawaii's hot spot(s) (October 9, 2011). * Quark soup (August 15, 2011). * NASA finds a chemical of life on a comet (September 1, 2009). Astrochymist, from David Woon, University of Illinois. http://www.astrochymist.org/. The chemistry of "out there" -- planets, stars, comets and interstellar space. Suggest that you start with the Astromolecule of the Month and the Astrochemistry FAQ. Much of the site is incomplete, but there is enough already to make this a fun and informative site. A section on Nucleosynthesis of The Elements, from Mark Leach, Meta-Synthesis, England. https://www.meta-synthesis.com/webbook/32_n-synth/nucleosynthesis.html. Nucleosynthesis is the process of making nuclei -- thus of making atoms. This happens in stars -- and especially in exploding stars. Another page of that web site is listed above in the section Periodic table. Origin of the Elements in the Solar System, by Jennifer Johnson, Sloan Digital Sky Surveys. Information about how the elements were formed is presented in the form of a color-coded periodic table. https://blog.sdss.org/2017/01/09/origin-of-the-elements-in-the-solar-system/. Added December 14, 2018. FusEdWeb: Fusion Energy Educational Web Site. https://fusedweb.llnl.gov/. From Lawrence Livermore. Low Dose Radiation Research Program (DOE). Are the effects of low doses of radiation -- those actually most commonly encountered -- predictable by extrapolating from high doses? It's not at all clear, and this site has lots of information on this murky subject. https://science.energy.gov/ber/research/bssd/low-dose-radiation/. 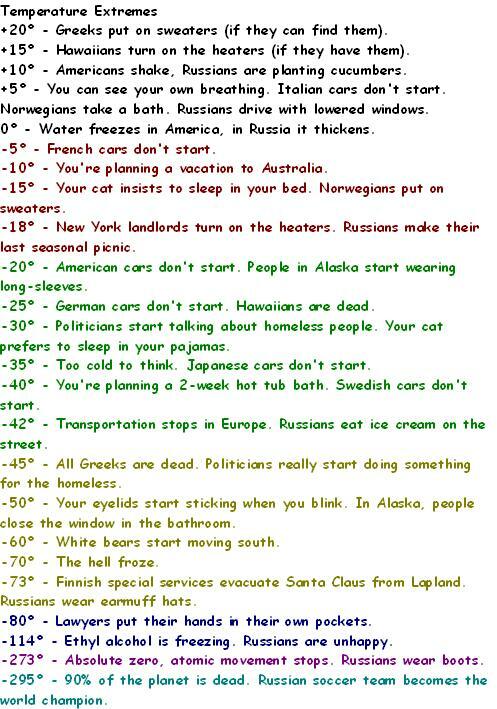 * How old is Venice, Italy? Evidence from peaches (March 24, 2018). The work here is affected by the C-14 calibration anomaly discussed above. * A bone from the original Santa Claus? (December 18, 2017). * The major source of positrons (antimatter) in our galaxy? (August 13, 2017). * Carbon-14 dating of confiscated ivory: what does it tell us about elephant poaching? (February 10, 2017). * How radioactive is your avocado (and some other common exposures)? (November 16, 2016). * Eye analysis: a 400-year-old shark (September 3, 2016). * Did the Fukushima nuclear accident lead to a burst of thyroid cancer? (July 17, 2016). * Could you find debris from a supernova in your backyard? (April 27, 2016). * A better way to oxidize americium? A step toward improved processing of nuclear reactor waste? (December 7, 2015). * Chernobyl exclusion zone: mammal populations (October 24, 2015). * Effect of low dose radiation on humans: some real data, at long last (July 24, 2015). And accompanying post. * Radioactivity released into ocean from Fukushima nuclear accident reaches North America (March 23, 2015). * Effect of radiation near Fukushima on local monkeys (August 10, 2014). * Are birds adapting to the radiation at Chernobyl? (August 3, 2014). * Berkeley RadWatch: Radiation in the environment -- Follow-up (May 6, 2014). * Berkeley RadWatch: Radiation in the environment (February 24, 2014). * Should physicists be allowed to use lead from ancient Roman shipwrecks? (December 2, 2013). * Atomic bombs and elephant poaching (October 25, 2013). * An improved CT scanner, with a reduced radiation dose (February 5, 2013). * Tree rings, carbon-14, cosmic rays, and a red crucifix (July 16, 2012). * Measuring radiation: The banana standard (April 17, 2011). * Does radiation treatment of cancer cause new cancers? (April 8, 2011). The ChemTime clock. Available at Dr Bassam Shakhashiri's "Science is Fun" web page http://scifun.chem.wisc.edu. Look for the clock (in right hand column, at last check), and click on its label for more information. Ionic liquids. A common rule of thumb is that ionic compounds are solids -- under "ordinary" conditions. The common salt NaCl serves as a good example. We can even explain this rule of thumb, as being due to the network nature of ionic solids. Section 11.2 of the Cracolice book (2/e) discusses this. It also notes that if one heats an ionic solid to its melting point, one obtains an ionic liquid; the "catch" is that the melting point of NaCl is 801 °C, and the melting points of other simple inorganic salts are also very high. However, there are some compounds that are ionic, but liquid at room temperature. The reason is simple enough: they contain large (covalent) ions, so that the ions in the crystal lattice are further apart, thus weakening the strength of the ionic bonding and lowering the melting point. These "room temperature ionic liquids" (RTIL) have become practical only since the 1990s, but they are now attracting considerable attention, because of their novel properties. The Wikipedia page is a good introduction to ionic liquids, and some of their possible uses: https://en.wikipedia.org/wiki/Ionic_liquid. My interest in ionic liquids was rekindled by M Jayakumar ("Jai"), at the Indira Gandhi Center for Atomic Research (IGCAR) in India. He is exploring the use of ionic liquids in recovering noble metals from used nuclear fuel rods; in this case, the hope is that the use of a non-aqueous polar solvent will simplify the chemical behavior of metals infamous for their complexity. Not only does Jai work with these ionic liquids, but he and his IGCAR colleagues help maintain this Wikipedia page. Also see the section: Water. Hydrates are chemicals in which water molecules are included in the crystal structure. One example is gypsum, which is calcium sulfate dihydrate, CaSO4.2H2O. Here is an article providing good evidence that desert plants may use the water of hydration in natural gypsum as a water source. S Palacio et al, The crystallization water of gypsum rocks is a relevant water source for plants. Nature Communications 5:4660, August 18, 2014. http://www.nature.com/ncomms/2014/140818/ncomms5660/full/ncomms5660.html. "2001 - A Molar Odyssey"
More at the Mole Day web site, which is maintained by The Moleman. Online resources for balancing equations typically deal only with "step 2" of the balancing procedure, as described in the Ch 8 handout. That is, given the correct formulas, the resource will deal with determining the balancing coefficients. This may be useful, but emphasize that it does not deal with finding the correct formulas. The most important thing for you to learn in this chapter is the concept of the balanced equation, which we will be using in subsequent chapters. You need to be able to develop equations, with proper chemical formulas, balance them, and know how the balanced equations can be used. An online exercise for practice balancing equations: https://education.jlab.org/elementbalancing/index.html. From S F Gagnon, Thomas Jefferson National Accelerator Facility. The program presents you an equation, and asks you to insert the balancing coefficients. Instant feedback as to whether you are right or not, but it does not offer any help if you are stuck. If this happens, write down the equation and ask me about it (e-mail). This program may be good practice for some people. Physiology of Respiration. http://historyofscience.free.fr/Lavoisier-Friends/a_chap4_lavoisier.html. This page describes how Lavoisier made the connection between ordinary combustion and burning our food. From Jean Pierre Poirier author of "Lavoisier, Chemist, Biologist, Economist" (University of Pennsylvania Press, 1996). I have also listed this page under Internet Resources for Organic and Biochemistry: Metabolism, and I have listed the larger Lavoisier site under Miscellaneous Chemistry Internet Resources: History. Atomic Orbitals. http://www.orbitals.com/orb/index.html. After browsing the introductory explanations, see the Grand Table for some great pictures. From David Manthey, an engineer. Properties of Gases: matter at its simplest. A presentation of the nature of gases, helpfully broken down into levels of detail. For intro chem, levels 1, 2 and 4 will be particularly helpful. http://www.chem1.com/acad/webtext/gas/. From Steve Lower, Simon Fraser University. This is part of a broader site, which is listed below under Other general chemistry courses. A nice tutorial on the gas laws, with good animations: https://legacyweb.chemistry.ohio-state.edu/betha/ -- and then choose Gas Laws. There are some other things at the site, too. The following site provides an animation of an ideal gas, with adjustable parameters. If nothing else, enjoy the hypnotic effect of watching the gas particles bounce around. There are also exercises, if you want to explore further. http://intro.chem.okstate.edu/1314F00/Laboratory/GLP.htm. STP = standard temperature and pressure. The term is used as a reference point for gases. Unfortunately, there is not agreement on what the standard T and standard P are. Our textbook uses T = 0° C and P = 1 atm; I am happy to stay with that reference point. However, other values are used. Most are fairly close, so the practical implications usually are small. Wikipedia has a page on this confusion. https://en.wikipedia.org/wiki/Standard_conditions_for_temperature_and_pressure. Also see the section: Hydrates (water of hydration). Why is water blue? http://www.dartmouth.edu/~etrnsfer/water.htm. Discusses in both general and technical terms how the weak blue color of water is related to its structure, including the hydrogen bonding in liquid water. Interestingly, they predict and show that water with the heavy isotope of H, 2H (deuterium), is much less blue. From Charles Braun and Sergei Smirnov at Dartmouth. A delightful page, based on an article originally published in J Chem Educ (70:612, August 1993), but now enhanced with color figures. This page is also listed on my page of Internet resources for Introduction to Organic and Biochemistry under Spectroscopy. Snowflakes and snow crystals. http://www.its.caltech.edu/~atomic/snowcrystals/. "Your online guide to snowflakes, snow crystals, and other ice phenomena." From Kenneth G. Libbrecht, Caltech. Also known as http://SnowCrystals.com. Origin of water on Earth. https://en.wikipedia.org/wiki/Origin_of_water_on_Earth. Floating water bridge. https://www.youtube.com/watch?v=W5PCUP6cGw4. A movie to accompany a paper listed in the chapter handout for water, by Fuchs et al, 2007. The work describes formation of a bridge of liquid water between two beakers -- by the application of high voltage. Why is mercury a liquid? A good introductory-level discussion. http://antoine.frostburg.edu/chem/senese/101/periodic/faq/why-is-mercury-liquid.shtml. The article introduces the idea of relativistic effects on electrons. It includes discussion of the electron sea model for metallic bonding, and comparison with the neighboring elements gold and thallium, in terms of electron configuration. This is part of Fred Senese's site, which is listed below as a General resource. C T Driscoll et al, Mercury contamination in forest and freshwater ecosystems in the northeastern United States. BioScience 57:17-28, 1/07. A good overview of the mercury hazard issues. Although the focus of the analysis here is regional, much of the overview and discussion is general. Free online at https://bioone.org/journals/BioScience/volume-57/issue-1/B570106/Mercury-Contamination-in-Forest-and-Freshwater-Ecosystems-in-the-Northeastern/10.1641/B570106.full. Nature's 'fibre optics' experts. http://news.bbc.co.uk/2/hi/science/nature/7720836.stm. News story, 11/10/08. Some deep sea sponges make silica spicules that seem remarkably like fiber optic cables. Recent work shows that these sponge spicules actually serve a biological role, funneling light down inside the sponge -- for the benefit of their photosynthetic symbionts, and hence for their own benefit. Of course, organisms that make silica do so under "ambient" conditions, not the harsh conditions required by chemists. A paper on this work is listed in the handout for Ch 13. This story is the basis of a post in my Musings newsletter: Croatian Tethya beam light to their partners (December 16, 2008). Glass Museum On Line. http://theglassmuseum.com/. Scroll down the page -- quite a ways -- to the list "Glass Museum Articles on Glass", at the left. Lots of fascinating material, on both art and technology. For example, try Gold Ruby Glass from Gibraltar. From Angela M Bowey in New Zealand. Researchers, including a group from UC Berkeley, have explored the tricks that the anthrax bacteria use to get the iron they need for growth. They found that these bacteria make two chemicals designed to steal iron from their host; such chemicals are generically called siderophores. One of these is attacked by the human immune system; however, the other -- the more novel one -- evades it, and actually succeeds in supplying iron to the bacteria. They suggest that this novel siderophore might be a good target for anti-anthrax drugs, or simply a marker for detection of this pathogen. The work was featured in the student newspaper: Researchers Find Possible Way to Block Anthrax, https://web.archive.org/web/20151218200851/http://archive.dailycal.org/article.php?id=22576. (Now archived.) For more about this work, see my Biotechnology in the News (BITN) "Other topics" page under anthrax. 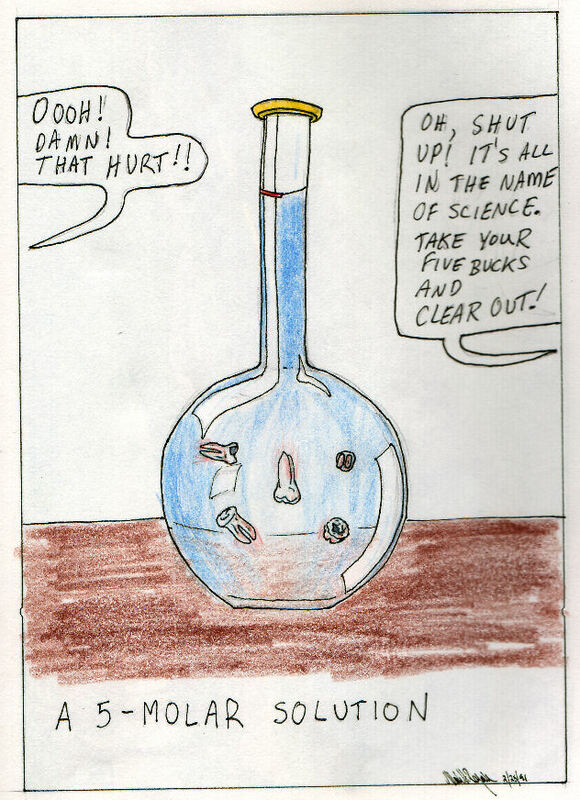 A cartoon illustrating what molarity means. http://web.archive.org/web/20060512172332/http://markrosengarten.com/Cartoons/5molarsolution.jpg. This is part of a set of cartoons, now archived, from Mark Rosengarten, Washingtonville (NY) High School; you can access the set at: http://web.archive.org/web/20080105092228/http://www.markrosengarten.com/chemcartoons.html. The common solubility rules -- in verse. http://pligon.scribnotes.com/1ap/APQtr1support/solubilitysong.html. Electrochemical energy storage and conversion. Steve Lower offered this page of his when someone asked about the difference between a fuel cell and a battery. http://www.chem1.com/acad/webtext/elchem/ec-6.html. This is part of a broader section on "All about electrochemistry", which is part of his Chem 1 textbook materials, listed below under Other general chemistry courses. Electricigenic bacteria -- bacteria that can couple their electron transport directly to an external electrode, and thus can serve as the basis of a microbial fuel cell. One of the examples most studied is the genus Geobacter. http://www.geobacter.org. From Derek Lovley, Univ Massachusetts. Also see: D Lovley, Microbial energizers: Fuel cells that keep on going. Microbe 1:323, 7/06. It is freely available at: http://www.asmscience.org/content/journal/microbe/10.1128/microbe.1.323.1. The Figure is Fig 4 of the paper in Microbe; it is also shown at the Geobacter site. A book about redox reactions is listed on my page of Books: Suggestions for general science reading: Waldman, Rust -- The longest war (2015). This topic came up in class, when a student asked about the odor and toxicity of dry erase markers. There are various brands and types of dry erase markers. The one marker that I checked -- a black marker, from Sanford -- has a low odor, suggesting that it uses an alcohol as the solvent. Particularly note that dry erase markers are different from other common marking pens -- probably less toxic. The "art and hobby materials" page listed below introduces some of the types of markers. The following link gives a list that should include some MSDS (material safety data sheet) for Sanford markers. These MSDS give an overview of the safety of these markers, but they do not give details of the composition. http://msdsop.newellrubbermaid.com/Pages/MsdsSearchResults.aspx?q=all. For more about MSDSs: Safety, MSDS section of Internet resources: Chemistry - Miscellaneous. The following link is to a page that generally discusses the safety of art and hobby materials. Browse down, and there is some mention of markers. https://toxicfreefuture.org/healthy-living/healthy-kids/fastfacts-art-hobby/. From Toxic-Free Future (formerly the Washington Toxics Coalition). This topic came up in class, when a student asked about the problem of mercury in vaccines, especially in the flu vaccine. I have posted two items on this. * My thimerosal page shows the structure of thimerosal and some related compounds, including aspirin. * I have a short note about thimerosal on BITN - Miscellaneous; section on vaccines. It includes a link to an FDA site. This FDA page should not necessarily be considered a final answer; however, it is well organized, and should serve to at least outline the issues, thus serving as a good starting point for a broader consideration of the compound. Let me know of questions. A particular question that came up was about the behavior of methyl mercury vs ethyl mercury. My bottom line is that this is not very clear. Although there is some evidence that the ethyl mercury may be less toxic, the evidence seems very limited. There are two factors to consider in making this comparison. One is chemical/physical behavior. Both are non-polar, and thus relatively soluble in fat (Ch 16). Offhand, I would not want to predict any difference between them on this point. The second issue is their precise biological action. I don't know of any detailed work on this; as already noted, the evidence that the ethyl mercury may be less toxic is weak, and I have not seen any detailed analysis or explanation of it. This topic is also listed under Introduction to Organic and Biochemistry Internet Resources: Alcohols, ethers, sulfur compounds. One Intro Chem class had considerable class discussion on how lights work. As part of that, students contributed some web sites. Thanks to all for their contributions! * A world atlas of darkness (July 29, 2016). * Effect of artificial lighting on the environment (September 3, 2015). * Why might it be good to put lights on fish nets? (September 9, 2013). * CFL and LED lights: energy-efficient, but toxic (March 3, 2013). * A possible hazard of using compact fluorescent light bulbs (November 13, 2012). * Light bulbs (July 1, 2009). Below are links to materials for some other courses that cover similar material, at one level or another. Sometimes you may find it useful to explore another view. If you had multiple books available, you might browse those on a particular topic. An alternative is to look at some on-line materials. Please let me know of experiences with these -- good or bad. Remember that different authors will present things differently; sometimes that is helpful, but sometimes it is confusion. Further, any of them -- or us -- may have errors in our presentations. So if you find something that seems confusing, or even wrong, let me know. And if you discover another set of posted materials that you think would be helpful, please let me know. An Introduction to Chemistry. A web version of a published book, at about the level of this course. From Mark Bishop, Monterey Peninsula College. http://preparatorychemistry.com/Bishop_Home.htm. Chem 1 General Chemistry Virtual Textbook, from Steve Lower, Simon Fraser University. http://www.chem1.com/acad/webtext/virtualtextbook.html. Sections of this are listed above, under Gasses and Redox reactions. Both of the above books are also listed for Internet resources: Chemistry - Miscellaneous -- Textbooks. ChemTeam - A Tutorial for High School Chemistry. "The ChemTeam provides study resources in all standard topics for students in high school and Advanced Placement chemistry." https://chemteam.info/ChemTeamIndex.html. From John L Park. General Chemistry Online!, from Fred Senese, Frostburg State University, Maryland. http://antoine.frostburg.edu/chem/senese/101/index.shtml. Sections of this are listed above, under Units; dimensional analysis and Mercury. Chemistry Software and Science Teaching Resources, from Ray Le Couteur. http://www.rayslearning.com/chemres.htm#Chemistry%20Resources. The Chemistry Hypermedia project, from Brian Tissue, Virginia Tech. https://www.tissuegroup.chem.vt.edu/chem-ed/index.html. Old, but still useful.